We were contacted by the team at Globber Australia recently to test out their newest range of scooters. Globber Australia have launched an exciting new product this year, called the EVO COMFORT. While this is different to the one seen in our review images, the EVO COMFORT is a nifty little product that converts from pushchair, to walking bike to a pre- schooler’s scooter, and eventually an older child’s scooter. Say what? Yep, a pusher/scooter all-in-one. How about that. The Globber EVO COMFORT includes a ‘walking bike’ mode with T-bar handles for parents and footrest for your child. As your child grows more confident, you can remove the footrest and he/she can help push along with their feet. When your kiddo reaches the age when they are ready to scoot independently, remove the seat section, insert the T-bar and off they go! There are four height settings too, so the EVO COMFORT will grow with your child. Now because our littlest boy is already at the scoot stage, we've road tested a Globber PRIMO. This scooter obviously doesn't come with the aforementioned seat option, but it does come with a steering lock button on front of deck to lock the steering for those kids (like ours) who are still learning and need a little more stability. The PRIMO range of Globber scooters is perfect for pre-school to school aged kids. We took our GLOBBER Primo to the Royal Botanical Gardens in Cranbourne for a try out. Now before you say anything.. yes, naughty Mummy forgot his helmet. We didn't scoot around for long because unbeknown to us, scooters are not actually allowed inside the gardens, so this little journey took us to the entrance and back again. Bear in mind our little chap is not the most confident in outdoor pursuits and he's never really taken to scooting or biking before. Perhaps the sturdiness of the Primo worked in his favour because he took to scooting on this occasion like a duck to water, and couldn't wait to get home and show off his new skills to his older brother. 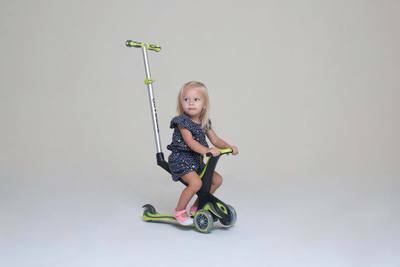 To celebrate Globber Australian's newest scooter range for kids and toddlers, we are giving away a Globber EVO COMFORT to a KidTown Melbourne reader. The Globber EVO COMFORT is valued at $200. To reiterate, this fantastic product is a pushchair, walking bike and scooter all-in-one! To enter this fantastic competition for your child, head over to KidTown Melbourne Instagram, comment and tag a friend to win. Comp ends 5pm EST Thursday 26 April 2018.